Pulse: Measles Resources, Nominations, Can PAs volunteer in community health? Your February Pulse is here. We know that when it comes to quality healthcare, PAs can handle it. Need help explaining this to your patients, medical team or friends? Don't forget about the AAPA's advertising campaign at yourpacan.org. WAPA is teaming up with the AAPA to promote this message in targeted ads, too -- so, spread the word! 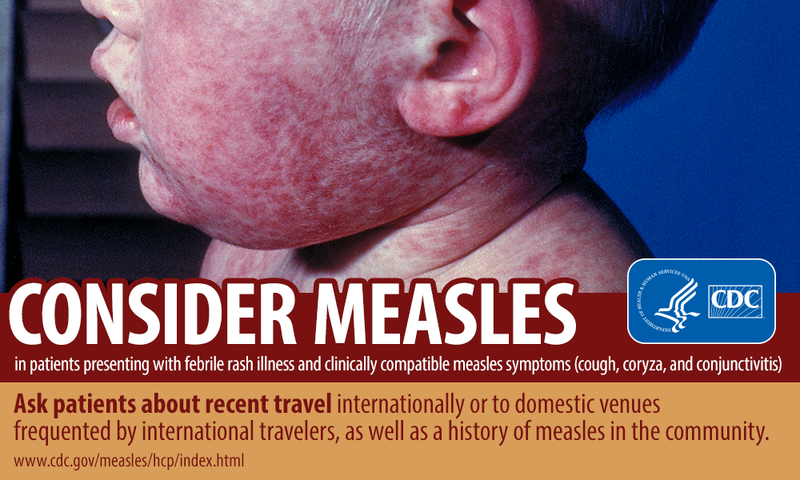 Measles is a highly contagious disease caused by the Rubeola virus. Currently, Washington State’s outbreak is averaging more than one new measles case a day and at least eight states have reported cases in 2019, mostly unvaccinated patients. The Wisconsin Department of Health Services has more information here and here. Report IMMEDIATELY by TELEPHONE to the patient’s local health department upon identification of a confirmed/suspected case. Within 24 hours, submit a case report electronically through the WI Electronic Surveillance Systems (WEDSS), or by mail or fax using an Acute and Communicable Disease Case Report, which can be found here. Encourage all your patients to get vaccinated. One dose of the MMR vaccine is 93 percent effective, two doses are 97-99 percent effective. Most patients have immunity within 2 weeks. Strengthen the voice of PAs in Wisconsin by telling your representatives what PAs do for their patients, everyday. Staff and volunteers will be present with all the information you need to be confident and be heard. Together, we'll celebrate the profession and advocate for new and meaningful health care reforms. Stay tuned for more details. What else can PAs do to help pass the Collaboration And Rural Expansion of Services (CARES) Act? Last session, Governor Walker signed into law 2017 Wisconsin Act 119, specifying that certain services may be covered by the Medical Assistance program if prescribed or ordered by a provider (such as a PA or NP) acting within the scope of the provider's practice. One of the benefits affected by Act 119 was personal care services. WAPA recently learned that DHS had not yet updated its policies to allow for PAs to order personal cares services in Medicaid. After discussions with the Wisconsin Personal Services Association, WAPA reached out the Department of Health Services (DHS). In conversations with DHS, we learned that in addition to personal care services, DHS plans to review the other services affected by Act 119 to ensure it is within a PA’s scope of practice, under applicable statutes, rules, or regulations. DHS plans to verify this with the Council on Physical Assistants. After DHS does this verification, they say they will issue a "Provider Update" clarifying the coverage of MA services prescribed or order by a provider acting within the scope of the provider’s practice. WAPA will continue to follow up with DHS on the status of this policy update, which is expected to be issued in two to three months. If you have a passion for advancing the PA profession, improving the practice environment in the state, and developing networking opportunities and more, then you are encouraged to nominate a colleague or apply directly before February 28. The elections will open in March and winners will be announced at the annual business meeting on April 4, 2019, at noon during the WAPA Spring CME Conference. All WAPA members are welcome to run for office, including new graduates. You do not need experience and self-nominations are accepted. The nomination form is online and you can email info@wapa.org if you have any questions. These are exciting times for PAs in Wisconsin as we are poised to bring Optimal Team Practice to our state. Not only is WAPA seeking to improve the practice environment in the state, we are also working to provide premiere CME conferences and to serve as a professional practice resource for both new graduates and seasoned PAs. If you are interested in leading these activities as well as giving back to your profession, please consider running for the office of WAPA President-Elect! The President-Elect succeeds to the Presidency at the conclusion of the first year. Responsibilities include organizing the annual election, serving as delegate to the AAPA 2020 House of Delegates, and assuming the duties of the President in his/her absence. This is a 3-year commitment to the Executive Committee which meets 4 times per year. Candidates must be a WAPA fellow member. If you are interested in strategic development, communication and event planning, then please consider running for this position. Regional representatives play a key role in WAPA leadership. Each representative serves as a voting member of the WAPA Board and acts as a liaison between the general membership and the Board of Directors. Responsibilities include attending 4 WAPA Board meetings per year and planning 2-4 regional events to discuss current issues facing PAs in the state. This is a 2-year commitment. Candidates must be a WAPA fellow member. The House of Delegates (HOD) is where policy governing our profession is made. If you are interested in representing Wisconsin PAs at a national level, please consider running for this position. 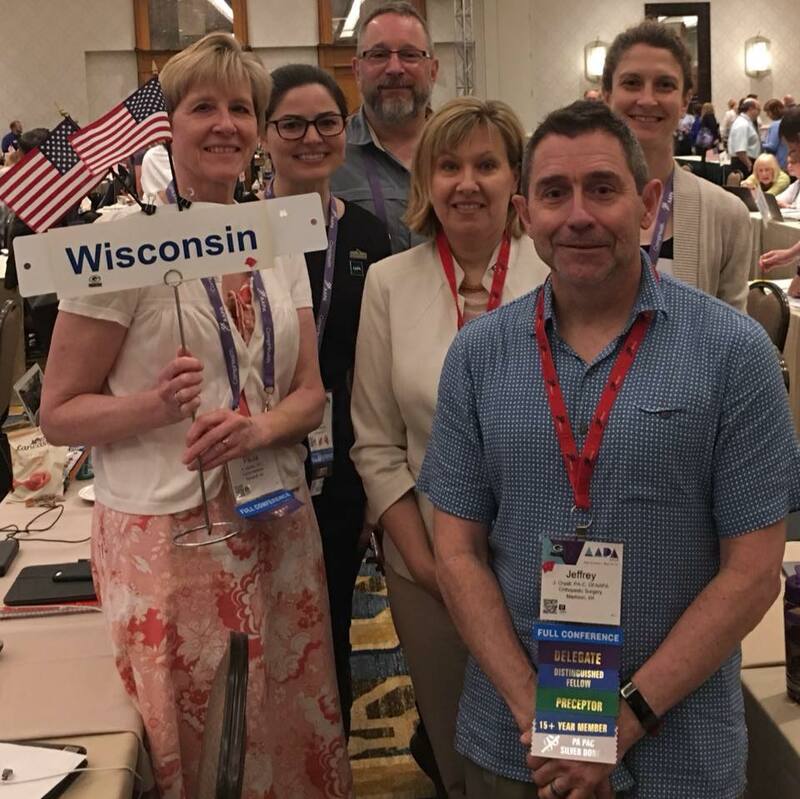 The Wisconsin delegation will have the opportunity to introduce resolutions and to vote on resolutions introduced by other states that will shape the future of our profession. Common resolution topics include Optimal Team Practice, professional title change, PA education, PA branding and marketing, and a variety of special interests. The 2020 AAPA conference will be held May16-20 in Nashville, TN. Travel and lodging will be reimbursed by WAPA. Want to get involved in different ways? The following committees are looking for more volunteers: Advocacy Committee, Communications Committee, CME Committee, Membership Committee and Professional Practice Committee. Email info@wapa.org to learn more. Pictured is Thomas Davey, Mai Vue and Michael Zimmer, MD. Thomas Davey, PA-C, out of Gundersen Health System is a busy PA.
"When I first started at the urgent care clinic (six years ago), I was the only PA on staff. It was pretty sparse, for PAs and NPs in the emergency room," he said. He works his normal .9 FTE job in Emergency Medicine/Urgent Care in addition to being a driving force behind a new fellowship program, the Gundersen Health System's Emergency Medicine Physician Assistant Fellowship Program. "I do end up doing a lot in my own time, but it’s important to me," he said. Davey is acting as the program director of the new Gundersen Health System's Emergency Medicine Physician Assistant Fellowship Program and he’s working with medical director Michael Zimmer, MD, FACEP. The first class will interview starting in March and start Summer of 2019. Currently they are working to hone the didactic curriculum and arrange simulation labs for the fellows. After the 18-month-long program, fellows are expected to sit for the Specialty Certificates of Added Qualifications (CAQ) test. "When I graduated I was only peripherally aware of fellowship and residency programs, but I have come to see how post-graduate programs may be utilized to fast track physician assistant training for high-paced, high-volume areas or rural areas," Davey explained. His employer still looks forward to hiring and teaching new graduates every year, but the time and expertise required to train entry-level graduates can be limiting -- especially in high-need areas like emergency medicine or rural communities. "The hope is that emergency medicine PAs can serve the regional area: that we are cultivating PAs who are interested in supporting the tri-state area; interested in emergency medicine; interested in working very independently; and, interested in operating at their highest levels," Davey said. You can tell Davey is working hard to create a fellowship pathway that serves the full community. Procedural training is conducted at Gundersen's Integrated Center for Education with rotations through Gundersen's affiliated Critical Access Hospital Emergency Services departments, EMS experience with our GundersenAIR and Gundersen Tri-State Ambulance and airway management with anesthesiology providers. Davey explained they are also collaborating with Tomah Memorial Hospital, and, eventually, would like to expand the program to serve other advanced practice providers as well. Regular students, too, who are already learning in the campus’ simulation and training lab, or are serving rotations in partner clinics, will also be invited to join the fellows as much as possible. "It is important to have a group that is fully invested in education," he said. We frequently receive phone calls from members with questions about supervising physician relationships and collaborative practice. Keep calling (414) 359-1650 or emailing WAPA with your practice questions and we will share them with the WAPA Professional Practice Team. Q: I have been asked by the YMCA Childcare center if I can be the "healthcare consultant" that is required for their accreditation process. This person is only needed if a health-related issue arises and then they would ask my input. I am happy to be this and think of this as a way of making our profession more known to the public. My question though is whether I am able to do this. Do I need a supervising physician to be in this role? I asked my employer if they were okay with me volunteering in this role and they said that I wouldn't be able to because I don't have a supervising physician. This is a role that I could see a nurse taking on. After all, this is kind of what school nurses do: advise on health related issues at school... What do you think? Can I do this? This is precisely why we need the PA modernization law to pass!!!! A: You're right -- this is another reason why we want the CARES Act passed! To answer your question, you absolutely can serve in this capacity but you will need a supervising physician. Copyright © 2019 Wisconsin Academy of Physician Assistants, All rights reserved. You are receiving this email because you are a 2018 member of the Wisconsin Academy of Physician Assistants.